BJJ promotes the concept that a smaller, weaker person can successfully defend against a bigger, stronger assailant by using proper technique, leverage, and most notably, taking the fight to the ground, and then applying joint-locks and chokeholds to defeat the opponent. Sparring (commonly referred to as "rolling") and live drilling play a major role in training. Our coed classes are available for both Juniors and Teens/adults in No Gi and Gi Training with belt ranking several times a week and perfectly compliment our martial arts and MMA training. 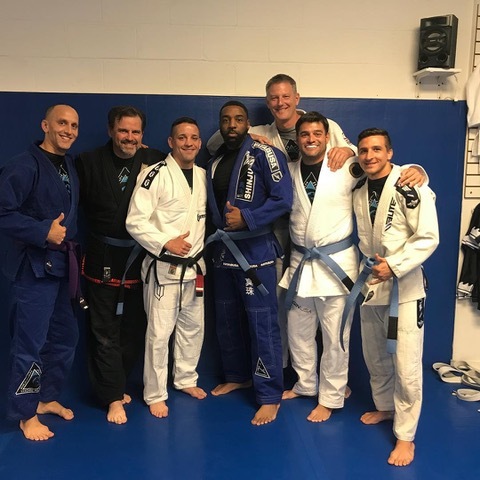 Our program is supervised by 3rd Degree Black Belt, Professor Bill Scott, owner and head instructor at BJJ Shore Academy. Our Tuesday evening and Saturday morning classes are taught by Professor Jay Malley, Black Belt under Professor Bill Scott/Team Pablo Popovitch. Featured Left to Right: Master Pablo Popovitch, Professor Jay Malley and Professor Bill Scott.